Here is a discussion about the effects of NOAA introduction of ERSST.v4. Later part deals with the latest status of the current El Nino event. Current status: A strong El Nino which is now declining. NOAA introduced new version ERSST.v4 from June 2015 instead of their earlier version ERSST.v3b SST departures, resulting in changes to many historical ENSO events including the current El Nino event (El Nino, La Nina, Enso Neutral). 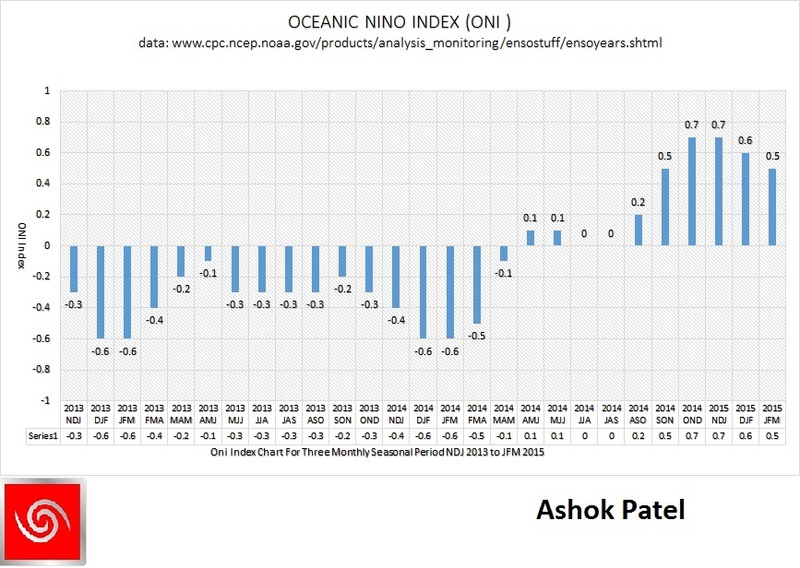 The ONI is based on SST departures from average in the Niño 3.4 region, and is a principal measure for monitoring, assessing, and predicting ENSO. Defined as the three-month running-mean SST departures in the Niño 3.4 region. Departures were based on ERSST.v3b till June 2015 and from then on wards are now based on a set of improved homogeneous historical SST analyses (Extended Reconstructed SST – ERSST.v4). The SST reconstruction methodology is described in Huang et al., 2015, J. Climate, vol. 28, 911-930.). Due to the adoption of SST departures from average in the Niño 3.4 region which is now based on a set of improved homogeneous historical SST analyses (Extended Reconstructed SST – ERSST.v4), the El Nino declared at the end of March 2015 went bust. Subsequently the current El Nino event was confirmed at the end of August 2015. The graph below shows that currently, a strong El Nino persists till March 2016, the last available 3 monthly season being JFM 2016. 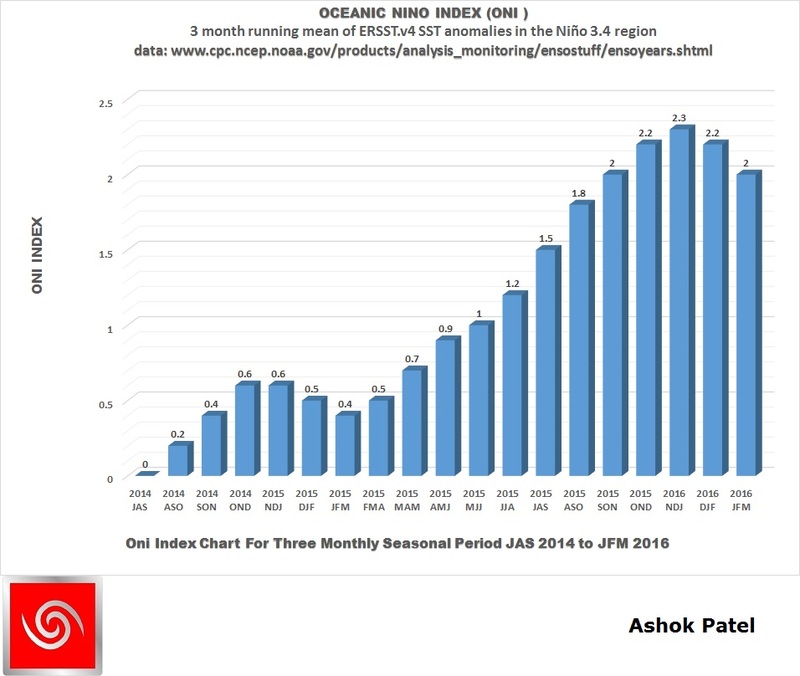 It also shows that the full fledged El Nino declared JFM 2015 went bust because the ONI index for JFM 2015 was marked down to +0.4 C which is below the El Nino thresh hold. Many past El Nino events have been downgraded or cancelled and some new La Nina events have been declared retrospectively and in the same way some La Nina events have been upgraded to ENSO neutral conditions and ENSO neutral conditions have been classified as El Nino events due to the introduction of Extended Reconstructed SST – ERSST.v4. The details of past ENSO events can be compared as per current ERSST.v4 and earlier ERSST.v3b available here ERSST.v4 and here ERSST.v3b. 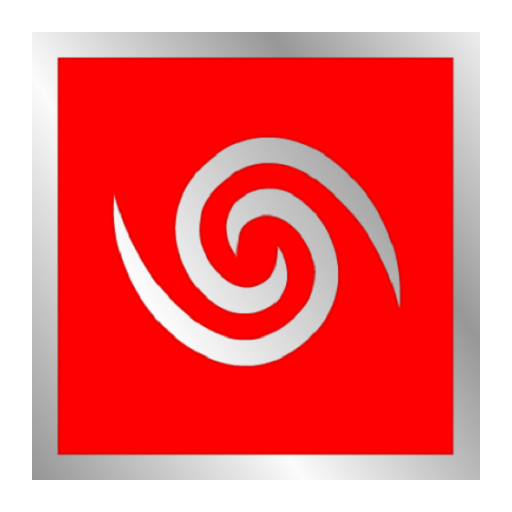 Image file has been created from screenshots of the ONI tables from respective links for convenience. The Climatology used for SST is 1981-2010. However, as per DESCRIPTION: Warm (red) and cold (blue) periods based on a threshold of +/- 0.5oC for the Oceanic Niño Index (ONI) [3 month running mean of ERSST.v4 SST anomalies in the Niño 3.4 region (5oN-5oS, 120o-170oW)], based on (click the link for details) centered 30-year base periods updated every 5 years . The update of Climatology should have been done in the beginning of 2016 to 30 year base period of 1986-2015. As and when the Climatology base year is updated, there will be some changes to ONI values of the most recent decades and may affect classification of ENSO events of the most recent decades. The ENSO Outlook is now at La Niña WATCH. While the current El Niño is expected to persist until late autumn or early winter, there are early signs that the chance of a La Niña developing by spring 2016 (Southern Hemisphere) has increased. The La Niña WATCH criteria have been met following expert assessment of the steady cooling in the surface and sub-surface of the tropical Pacific Ocean and updated model outlooks indicating increased likelihood of cooling to La Niña thresholds by spring (Southern Hemisphere) 2016. A La Niña WATCH means that there is approximately a 50% chance of a La Niña developing in 2016, which is about twice the normal likelihood. The Southern Oscillation Index (SOI) is in the negative territory from June end 2015 till date mostly in negative zone (-7.0 or less) with a brief neutral zone in November 2015 ( -5.3) and March 2016 (-4.7). 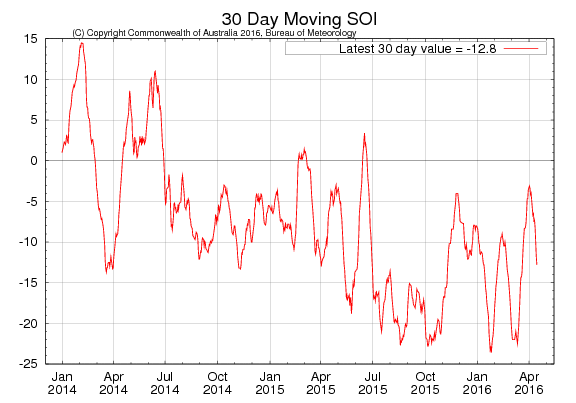 The latest 30-day SOI value from BOM-Australian Government for period ending 18 April is −16.4.